Riverside Park is a multipurpose facility which includes 3 baseball/softball fields, a practice field that converts into both soccer/football space, a lighted basketball court, skate park, tennis courts, and a playground. As if that wasn’t enough reason to spend lots of time here, the Warner River runs right through the park, creating a scenic spot for walks and picnics. Riverside Park is centrally located just off Main Street in downtown Warner and is open daily until 9pm in season. 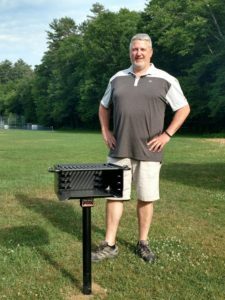 Warner Parks and Rec would like to extend a big “Thank You” to Darryl Parker for his recent donation of a new grill for Riverside Park. Thanks, Darryl!